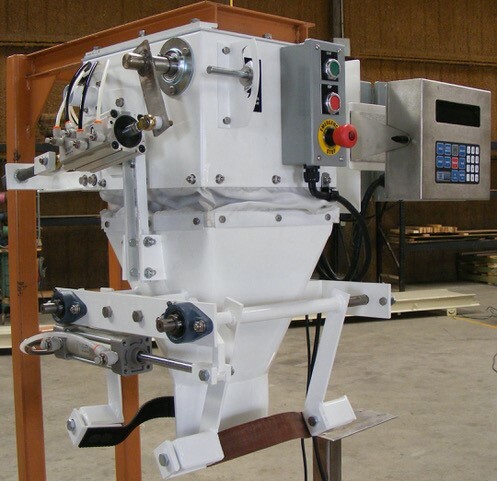 A fertilizer bagging machine, such as the Gravity Flow Open Mouth Bagger (GWB), fills open mouth bags with dry, free-flowing and minimally dusty fertilizer granules at a rate up to 5-8 bags per minute (300-480 bags per hour). The bags most commonly used with this machine are an open top poly bag or a poly-lined paper bag. The bags are filled to a 50-pound target weight. 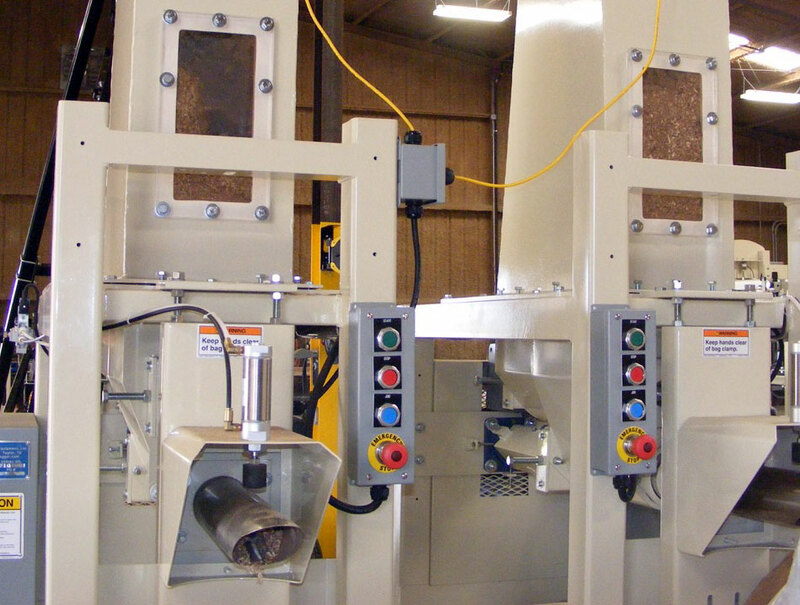 The CBE Model 250 Re-Bagger allows for recycling and repackaging of rejected material from existing open mouth and valve bags into valve bags. This bag filling machine is capable of filling up to 5 bags per minute. The volumetric auger bag filler with a high intensity densifier is used for filling bags with light weight fibrous materials such as linted cottonseed hulls, cedar fiber and synthetic fibers. The video below shows a robot that stacks filled 50 pound paper valve bags onto a wooden shipping pallet located on the floor per the programmed bag placement design. This robot was added to an existing bag filling system to reduce labor costs. This flour bagging machine fills and seals valve bags at a rate of 3-4 bags per minute with good weight fill accuracy. Filling can be mostly dust free with this type of flour, but dust collection is still recommended. This is a proven design refined over many years to give users an accurate fill weight. It is ergonomically designed to reduce repetitive motions and have a quick fill time with convenient access for maintenance. After the flood waters recede from a large storm like Hurricane Harvey, there will be many buildings and homes that will need to be repaired or completely demolished due to flood and wind damage. 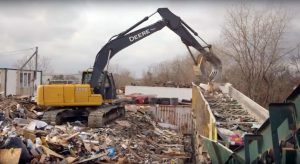 The resulting construction and demolition debris and material can be processed to separate and recover materials such as OCC, wood, ferrous and non-ferrous metals, rock / cement, dirt / ADC, plastics. Using an automated C&D Waste Recycling Plant can greatly decrease the manual labor necessary to sort through many thousands of tons of debris and waste. 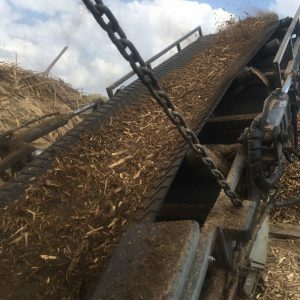 Wooden shipping pallets are shredded or ground up and are conveyed to a storage pile using a belt conveyor. An overhead self-cleaning magnet can be used over the belt conveyor to remove tramp metal, staples and nails before the material is fed onto the pile. 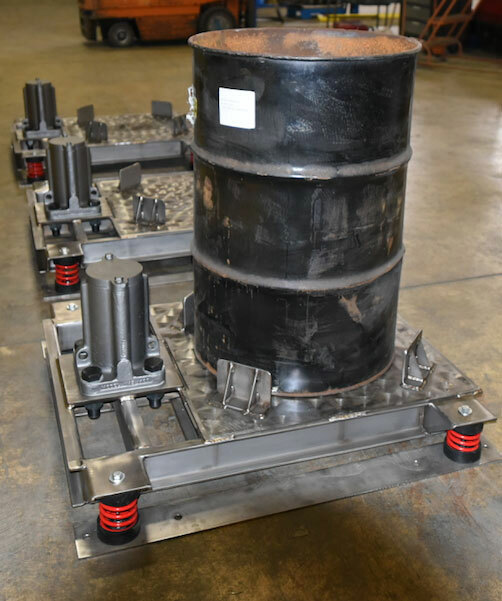 The magnet can be designed to fit conveyor belt width and speed. 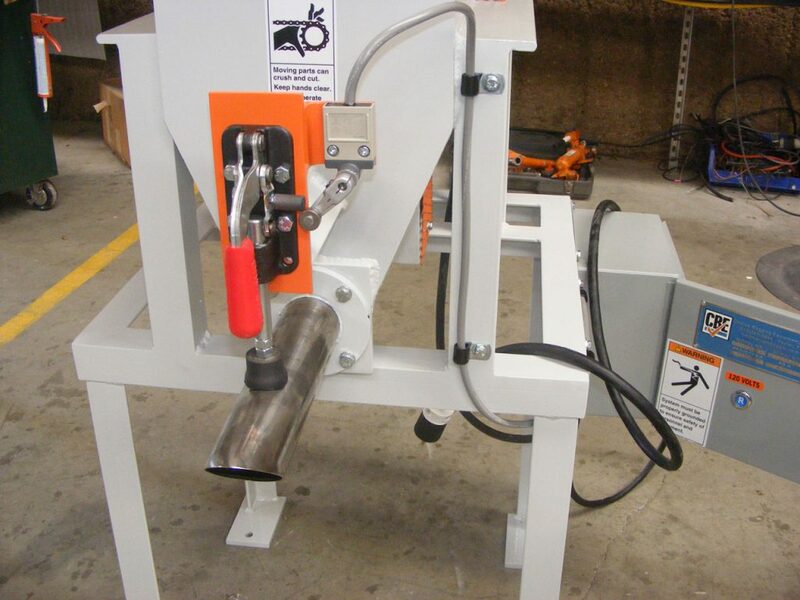 The CBE Model 730 Pressure Flow Air Valve Bag Filling Machine is used for bagging mineral powders, mortar mixes and food products into valve bags with internal spouts. Types of powders can include cement powder, specialty chemical powders, bentonite, barite, sodium bicarbonate, limestone powder and mortar mixes. This bagging machine can also be used for food products. The operator, or robot, places the valve bag onto the filling spout. Then, compressed air forces the powder material from a hopper above the bagging machine into the bag. When the valve bag is filled to a desired weight, it drops away onto a take away conveyor. A commercial waste recycling system was designed to improve the recovery rate of OCC (Old Corrugated Cardboard) at a transfer station. 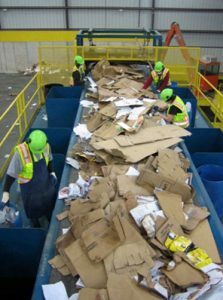 The transfer station operator was recovering OCC cardboard from the tipping floor from mixed loads of commercial waste accounts. Recovery of the OCC was a slow and dangerous process with sorters on the tipping floor.